Cloves, also known as ‘Laung’ in Hindi, is an herb that possesses a sweet yet spicy fragrance. It is truly one of nature’s most precious resource derived from an evergreen tree, which is rich in many beneficial vitamins and minerals like iron, potassium, calcium as well as Vitamin A and C. Though the health benefits of Clove are well documented, this herb is also worldwide known for its healing and restoring powers. Cloves are one of the most expensive spices, They are often used in Ayurvedic medicine for their anti-fungal, antibacterial, antiseptic and analgesic properties. Cloves are loaded with antioxidants and are a rich source of minerals, omega-3 fatty acids, fiber and vitamins. Another big advantage of using cloves in your daily life is that it naturally boosts your antioxidant level, provide relief from toothache, and is nature’s strongest immune system booster. It is also a powerful antibiotic which aids digestion and improve the overall health. Cloves or Laung are a great remedy to improve your physical, mental as well as emotional health. The seasoning capabilities make it very easy to blend in many dishes, beverages and desserts. It helps to provide strong flavour and aroma to the food it is added to. Clove/Laung is the English name for this spice, it is scientifically called as Syzygium aromaticum. It is commonly named as Lavang in Gujarati, Hindi, Marathi, Labanga in Bengali, Orissa, Lavanga in Kannada, Ruang in Kashmiri, Krambu in Malayalam, Tamil, Long in Punjabi, Lavangalu in Telugu. Cloves/Laung are the best remedy to treat dental health problems and is one of the reasons it is present as an ingredient in most of the toothpastes. Cloves can also be used to reduce swelling in the gums, treats infected tooth as well as provide relief from painful tooth. Not many people know this, but cloves/Laung are highly beneficial in treating morning sickness. To treat morning sickness naturally, take around ten grains of cloves, and add them to tamarind and palm sugar and make a paste using water. Now use this mixture twice a day to get rid of the morning sickness. Cloves/Laung are rich in antibacterial and anti-fungal properties that kills the bacteria that cause sinus infection. All you need to do is to take a clove oil and use it to clear respiratory passages, improve breathing as well as to treat congestion naturally. You can also try inhaling clove powder into your nose using a straw to relieve the problems caused by sinus infection. Cloves are one of the most effective remedy to treat cough and cold naturally. Adding cloves to the food you eat as seasoning also works well to cure cough and cold. You can also choose to take a glass of lukewarm water and add a few drops of clove oil and honey to it. Stir well and drink this mixture twice or thrice a day. Laung act as a great Aphrodisiac, which help you stimulate the sexual desire and also provide relief from exhaustion, stress as well as day long tiredness. Cloves are the best remedy to naturally get rid of stress and also soothes your senses. All you need to do is to take some leaves of basil, cardamom and mint and add some lukewarm water to make a flavored tea. You can even add honey to it to make it taste better. Clove/Laung oil contains anti-inflammatory properties and pain-relieving properties that offer cool and soothing effect that helps you relieve pain. It also provides relief from headache, migraine as well as cold and tension. Cloves are known for its carminative properties that improves the digestion process. It also relieves flatulence and prevent the formation of gas and acid in the stomach. This spice contains natural antiseptic properties that clean bacteria and helps to decay matter from the palate, upper part of the throat and most importantly tongue. The strong aromatic qualities of cloves also helps to fight foul breath. Take a few pieces of cloves and chew it for some time to get rid of bad breath. Being a source of antibacterial, anti-inflammatory and expectorant properties, cloves possess many such abilities that are proven effective in improving respiratory conditions. 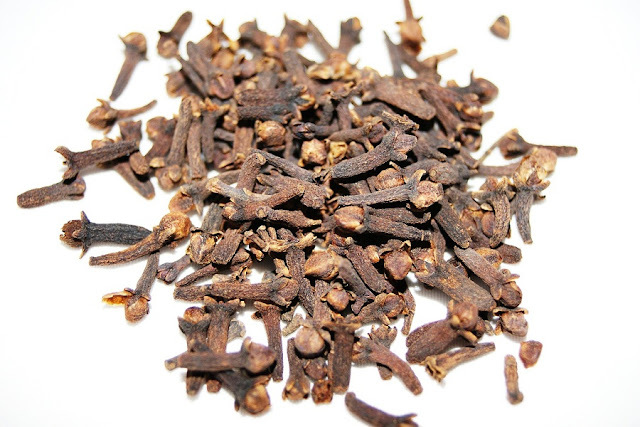 Cloves can be used to treat stuffy nose, asthma, tuberculosis, viral infections, cold, and many other sinus conditions. Clove oil works wonder in alleviating joint pain, arthritis, as well as provide relief from muscle aches by reducing inflammation due to its anti-inflammatory and analgesic properties. It is also a great source of calcium, iron and omega-3 fatty acids that helps to strengthen joints and bones. To treat the problem of flatulence just takes some Clove powder and mix it with some water and use it in the preparation of tea.